Just like a good book has the capacity of transporting you into a different world, a beautiful postcard can potentially make you feel like you are in a destination far, far away. It’s about what’s in the paper, combined with your own imagination. When you allow your mind to immerse itself in an image, it can almost feel as if your own body is already traveling. Nowadays, it’s so common for folks to share photos of their travels on Facebook and Instagram. Almost all of us do it these days! We post images of the places where we are, right when we’re there. It’s instant, it’s immediate, and it feels good. But it also lacks a certain romantic feel to it. When you return from your trip, friends and family are less likely to ask you about your travels because, in a way, it’s like you have already shared those details with them. But the silly thing in that you actually haven’t! Sharing little moments from your trips on social media can never compare with how intimate it is to talk about it face to face when you’re back. Traveling can be so exciting that it’s normal if you don’t want to wait until you are back to share everything you’ve seen, done and felt. That’s even truer when you travel long term, like us. That’s when postcards, as in REAL postcards and not ecards, come in! Call me old-school, but I love postcards! When we started Backpack ME, we used to send out a physical postcard to every single new newsletter subscriber we had. We posted hundreds and hundreds of cards to all over the world! I remember hitting a local post office in Phnom Penh and having the lady behind the counter looking at us as if we were crazy because of the biblical stack of cards we had to mail out to all corners of the world. I also remember sipping an iced coffee on the Thai island of Koh Pi Pi, during a hot afternoon when my only “job” was to write cards to some of our readers. I even remember the stamp glue that partially eroded my finger in New Delhi, after mailing another load of cards, with love, from India. Eventually, sending out a card to every single Backpack ME reader became unsustainable. That is a good sign, of course, but that doesn’t mean we ever stopped loving sending out cards. Apps like MyPostcard make things easier these days. Now, we don’t have to buy cards and collect stamps that will cover the expense of sending the postcard to different sides of the world. MyPostcard takes care of the logistics and you get to turn your own travel photos into eye-catching cards. It’s a wonderful process because it’s personal and meaningful, yet it remains easy and affordable. Whether you use the website or the app, MyPostcard lets you import photos from your own phone reel, as well as from other online accounts like Facebook, Instagram, Flicker or Google Drive. Alternatively, you can simply take a photo right there and then, even though this option clearly is geared towards the most spontaneous folks out there! Another fun possibility consists in taking a snapshot of a map that indicates your geographical location. But, of course, you don’t have to choose between photos and maps… you can mix and match to make a design that you fancy, using the different available templates and themes. The point is to get creative and personalize it all to your heart’s content. No two postcards have to be the same! For example, no more having a plain and boring card with a photo of the Taj Mahal, when you can have yourself posing in front of it, with a photo right next to it that shows the delicious curry you had on the same day, a selfie with a kid you met standing in line to get inside this monument, and an artistic little shot of the sunset as seen from your hotel window. Sounds more special and fun than something printed out by the thousands in a factory somewhere, doesn’t it? Once you’re done with the image side of the postcard, it’s time to write the content and the address at the back, just like you would do with a physical postcard. At the end of the day, this is going to be a physical card indeed! Sending out a real regular sized postcard with MyPoscard only costs $1.99, with printing and postage to anywhere in the world included. Delivery will only take a few days within Europe and North America, and up to 14 days to the rest of the world. 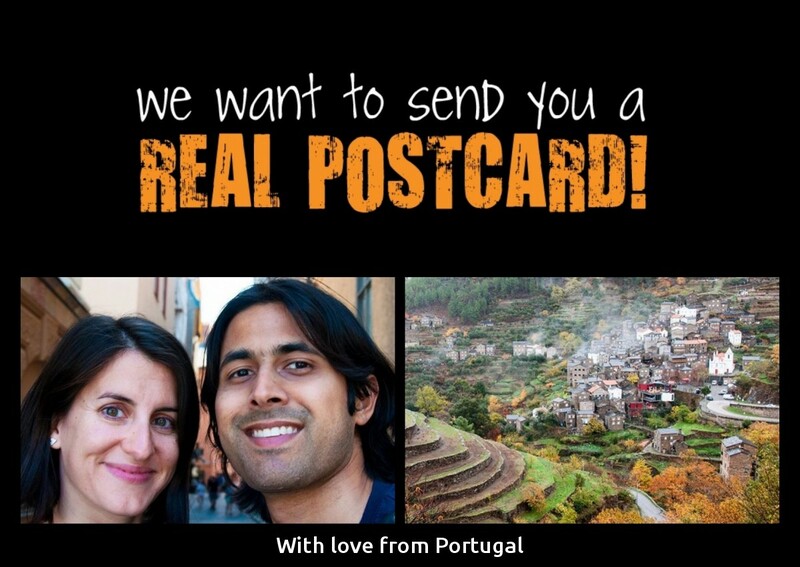 We want to send you a postcard from Portugal! we’d like to send you a card again! Simply leave us a comment telling us a little bit about yourself: where in the world you are, why we should come and visit sometime, and what are your upcoming travel plans or wishes. We will get back to you… but this time it won’t be immediate! 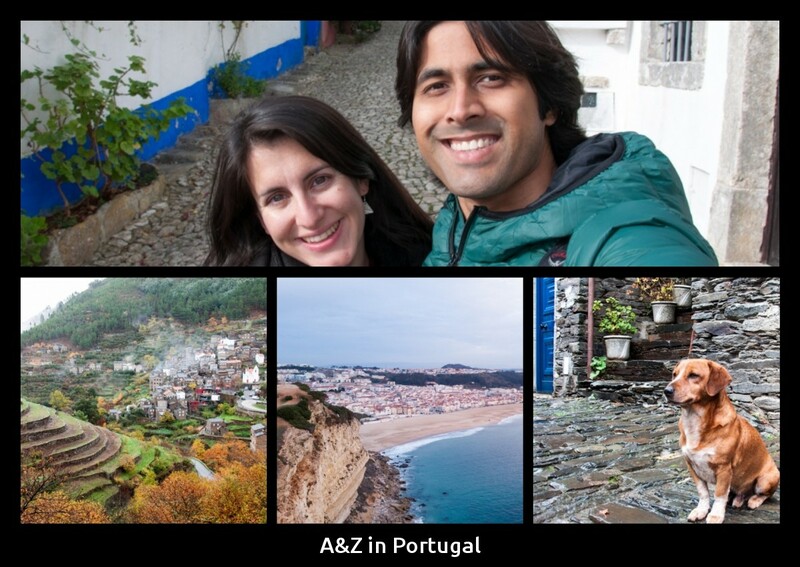 We will send you a postcard from Portugal, also showing you why you should come and visit if you haven’t yet. Kindly note that we’re sending out real cards to the first 10 people leaving a comment, but all messages are appreciated and will get a reply. If you’d like to try out MyPostcard and send a card online too, simply download the app and use the code backpackme to send out one postcard for free, to anyone you love, anywhere in the world! Let’s celebrate slow travel, worthwhile souvenirs, and meaningful human connections, shall we? Real postcards are the best! I always send them! When I lived in Mexico it KILLED me that many fantastic places didn’t have postcards. Agree! Best gift for my mom! She always says that gift cards are forever. So cute! I love postcards… and fridge magnets too! They’re always inexpensive and remind you of the place you traveled to. When traveling overseas I send postcards to family at home. Having just returned from India, I didn’t send a single one. It doesn’t appear to be a thing over there. They had to suffice with my photos on FB and IG. I have kept one postcard I got from u on my desk… Always love to receive one. that’s a beautiful idea :) after 9 weeks of travelling southeastasia I’m back in my German home town to visit my family. It’s a tiny town called Eibenstock, very quiet, surrounded by beautiful nature, a good place to calm down. I recommend a visit in late spring, summer or early autumn though. It’s still a bit chilly here (it snowed yesterday…. again) which is why I’ll probably escape to Spain in the next few weeks. I did receive a postcard from you in the past from Santiago, Chile. Postcards give me a feeling of nostalgia of any place and feels more real! 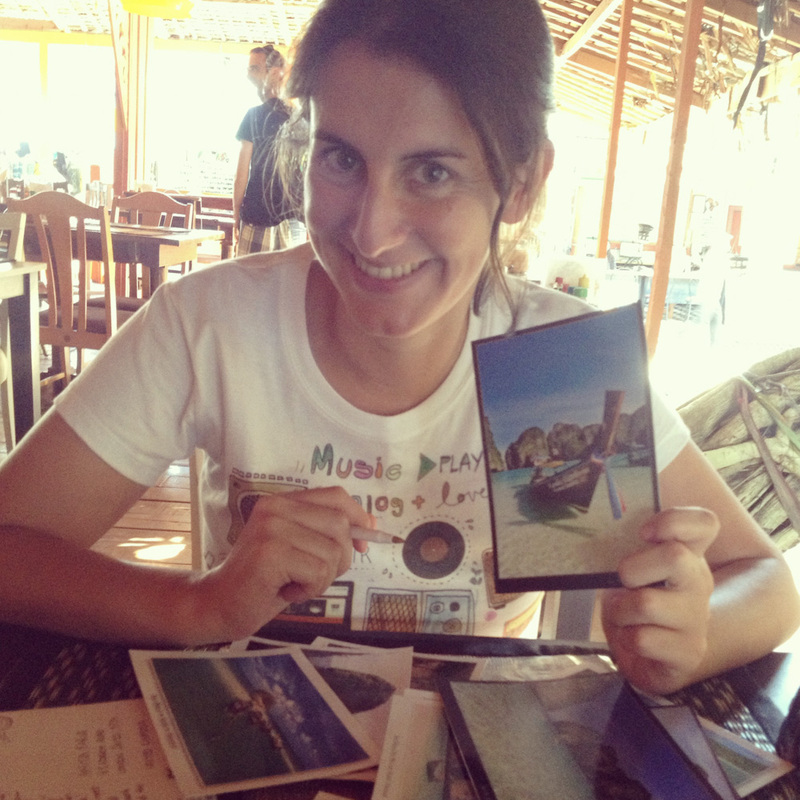 I have recently got into the habit of mailing myself a postcard when I travel with a note on what travel means to me. Currently, I am based on Milwaukee, Wisconsin – home of Harley-Davidson. This Labor Day weekend (first weekend of September) we will celebrating 115 years of Harley-Davidson which I think is a compelling reason to visit this part of the world. As for my travel plans, I am thinking Cuba. It’s quite fun reading your realistic experiences around the world! I plan on travelling to Germany soon.If you guys happen to visit Bangalore, India would love to catch up with you guys! Cheers!